1998 I called on Samuel Kim at Santa Rosa Valley Nursery, Camarillo. 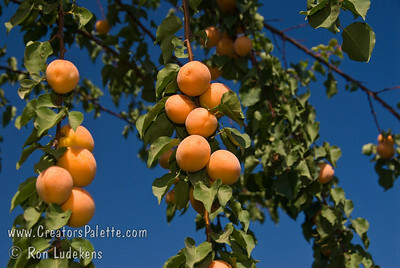 He took me to an older apricot tree in his parking area which set quantities of fruit and no one could identify it for him. I returned in late June/early July and told him it was either a Blenheim or Royal. Sam did not agree as he had planted both varieties about 50' away and neither would fruit because of the warm winters and lack of chill hours. I told him it was likely a sport of Royal because of fruiting date and this sport required less chilling hours. I took budwood in the summer of 1999 to bud a few trees and plant in our orchard near a Blenheim Apricot to compare the flowering date which would assist me to understand the chilling hours. We dug the trees December 2000 and I have one in our research orchard planted February 2, 2001. The fruit is similar to the Blenheim/Royal fruit but sets very heavily where the limbs weep from the fruit load. The flowering date is only a day or two ahead of Blenheim but a very profuse bloomer. I originally grew some for Sam calling it "Santa Rosa Valley" so he could sell them. Local nurserymen learned of it. Sam asked me to go ahead and grow the selection for others and name it as we wanted. He was close to retiring. The tree was named TROPIC GOLD™ and trade marked by the L. E. Cooke Co. We went into production in 2008 and seeing increased demand every year. As far as nurseries in the Ventura/Camarillo area that got trees from Sam, they like the variety for production and fruit quality. 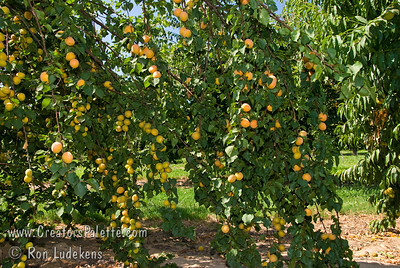 The tree produces well in the mild winter coastal areas and has abundant quality fruit in our hot summer Visalia climate.